"Encyclopedic in scope and full of very relevant work drawn from the fields of biology, psychology, criminology, and corrections, this book is a must-read for those working with girl and women offenders." "In this timely and thoughtful book, van Wormer provides a gender-sensitive lens through which the reader can examine pathways to female criminality, a global perspective on female crime and punishment, and innovative treatment approaches. This book is a must-have for any student or professional who wishes to truly impact and empower the lives of female offenders." "This book is timely in light of promising developments that are taking place at every level of the criminal justice system. It is a must-read for policymakers, practitioners, academics, and students in criminal justice, social work, and other related fields." 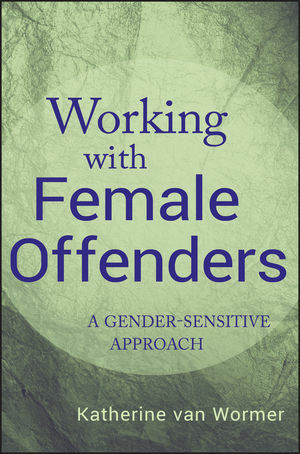 Taking into account the special needs of girls and women within a system designed by men for male offenders, Working with Female Offenders offers counselors, correctional officers, lawyers, probation officers—in short, anyone who works in some capacity with female offenders–an evidence-based, gentler approach for working effectively and successfully with girls and women in trouble with the law. Working with Female Offenders provides coverage devoted to the nature of female crime and to the institutional settings in which much of the female-specific programming is designed to take place. This timely volume equips professionals with proven counseling strategies tailored to fit this population. Working with Female Offenders addresses the unique challenges of female offenders and those who treat them, and provides a much needed addition to the literature on innovative programming for female offenders. KATHERINE VAN WORMER is a Professor in the Department of Social Work at the University of Northern Iowa. She has also taught in the departments of sociology and criminal justice. Van Wormer is the author of fourteen books and numerous book chapters and journal articles. Among her scholarship awards, she has won the McKay Faculty Research Award, the Faculty Excellence Award, and the Outstanding Scholarship Award.